It seems like a lot of people like to let the spaces in their home breathe a little after all of the Christmas decoration overload comes down. I think that I fall right in with that crowd. My Christmas mantel and hearth was loaded with stuff over the holidays, so I was more than ready for a serene look to carry me through winter. Maybe you saw this sneak peek that I posted on Instagram last week. BTW – I’d love for you to follow along with me there, if you don’t already. Just click HERE. The wood and metal piece, that I hung above the fireplace last year, has turned out to be a great purchase for me. It works well as a really good backdrop for just about anything. I get asked about this piece a lot. I got it at Kirklands – click HERE for the link to it. This time of year the woods around my house are filled with evergreen pines, bare branches and pretty pinecones, so that’s what I took my inspiration from. 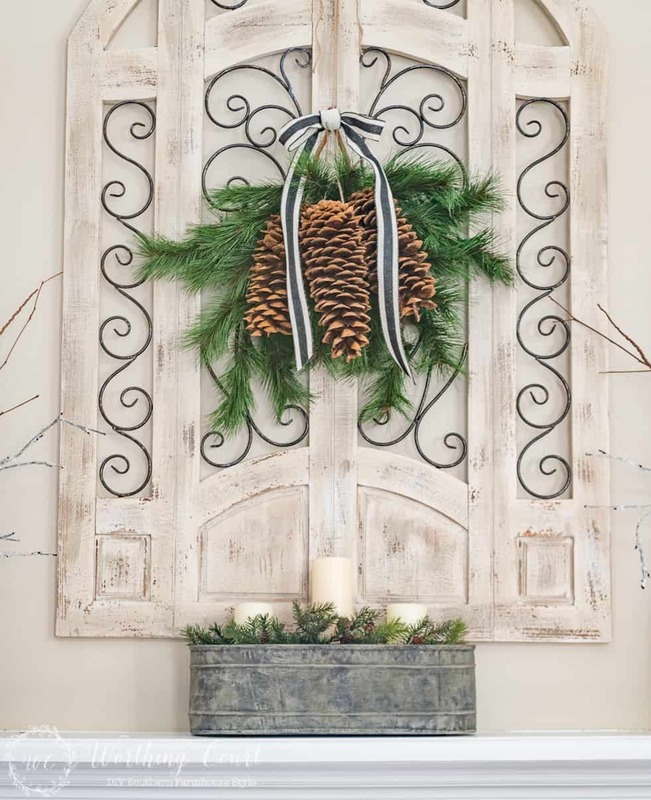 Instead of a wreath, I tied together two sprays of faux pine branches and three ginormous pinecones with jute twine. The black and white piece of ribbon gives it a nice little pop. An oblong planter from my stash, is filled with candles and more bits of faux greenery. 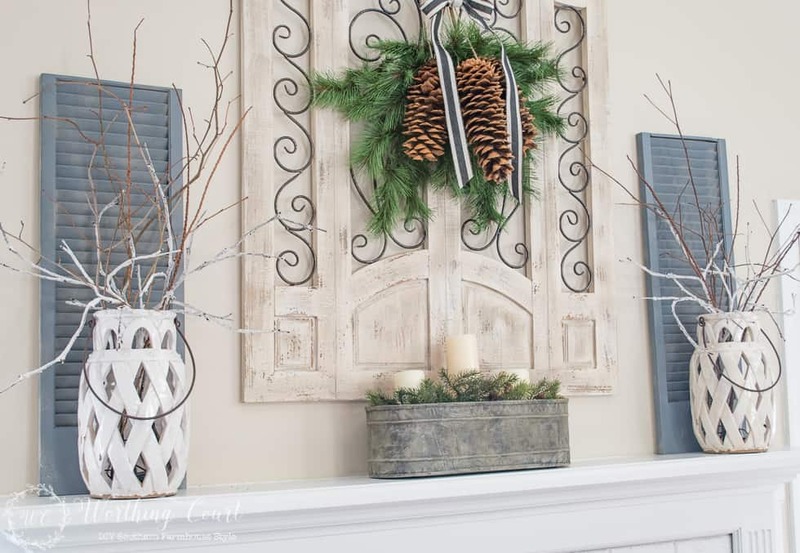 I kept the shutters in place that I used for Christmas and added two urns that I purchased at the Pottery Barn Outlet last summer. I’ve been itching to use them! They’re filled with white branches from my Christmas foyer and sticks that I cut from some trees around my yard. Down on the hearth, I placed two chunky white candlesticks that I purchased on the same trip to the PB Oulet. Oh, dear I love that place. The candles have a little jute twine wrapped around them and I added a small twig wreath around each one for added texture. On the other side of the hearth, I filled a basket with more faux greenery and ginormous pinecones. And a wire basket filled with skeins of yarn adds a bit of coziness. 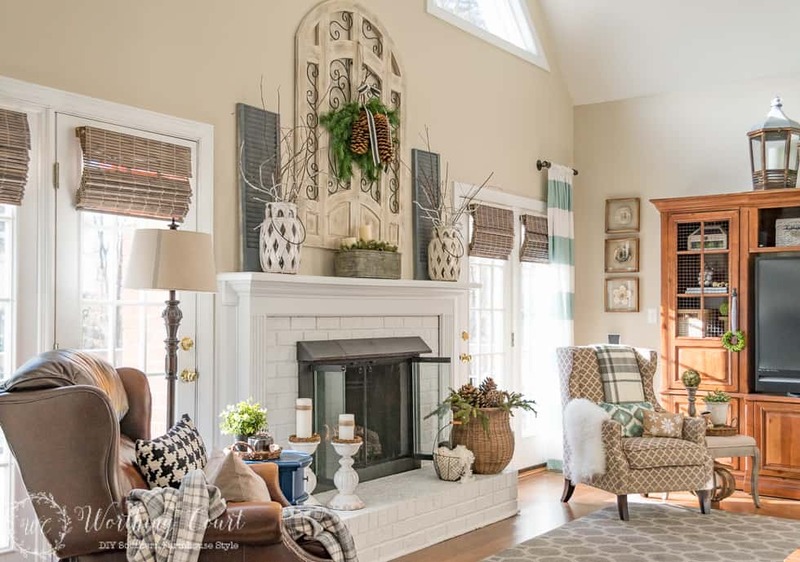 In spite of the breathing room that I left on the mantel and hearth, the whole area feels cozy to me by the time that throws and pillows are thrown into the mix. How about you – do you like to let your house breathe a little after the holidays? Yes, I do! I waited weeks before I put anything back on the mantle. Love your den, it is beautiful! I love the light happy winter look. Winter in Ohio has been really drab this year and this brightens up the area and still have the coziness. I just love it. I’ve been surfing your blog for the past few hours for decorating tips and inspiration. We built our house in 2006 on the east coast of FLorida. It’s time to redecorate. I hired a decorator the first time around, but it was very pricey at $70 dollars an hour. I decided to try it myself this time. I’m so overwhelmed about this project. Where do I begin? Painting the walls? Most of my furnishings are To mmy Bahama which will stay,as well as the custom woven woods window treatments. I wish I had your talent in putting things together. Your home is gorgeous! Can you give me some advice? Hi Nancie. I TOTALLY understand feeling so overwhelmed! Here are is how I tend to approach decorating: 1) Know the overall feel that I want the house to have so that all of the rooms will flow together. I don’t want farmhouse/rustic in one room and totally modern in another. I’ve been very unsuccessful when I’ve tried to work on my whole house all at once. I have to take it one room at a time or else no rooms ever get completely finished. That doesn’t mean that I don’t make an exception if I happen to run across the perfect thing for a room other than the one I’m currently working on though. 2) If you’re changing the color of your walls, I recommend waiting to choose paint until the fabrics and rugs have been chosen. It’s easy to get paint in nearly any color, but it’s not so easy to buy fabric or rugs to go with paint. 3) Before I decorate, something has to inspire me. It could be a fabric, images from Pinterest or magazines. It sounds like you already have some inspiration in the form of your furniture and window treatments. Have you tried doing a search on Pinterest for “Tommy Bahama decor”? Hope these tips help! can you please let me know where you got that cute little blu table next to the chair? Hi Julie. I’ve had that little table for years! It used to be olive green with gold colored accents. I painted it with ASCP in Napoleonic Blue a couple of years ago. You have great decorating taste. Hi Suzy, I’ve followed your blog for a long time. I absolutely love the colors in this room. Would you mind sharing what color of paint you used? It is neutral, but very warm. Love the blue you used for spots of color. Hi Marty. We used Sherwin Williams Accessible Beige. Nice to hear from you! Hi, can you please tell me where you got your woven woods on your French doors? I have the same doors and your woven woods are just what I’m looking for. Your home is beautiful! Thank you so much, Charlotte! I got the woven wood blinds at Home Depot. I thought they were very affordable and were already sized for a french door, which was nice. Hi Suzy, I love everything about your room and all of your decorating! Would you mind telling me where you got your short curtain rods and how long they are? I have been looking for some without buying and cutting off, but may have to. Thank you, Shelley! The curtain rods are actually made from a wood dowel – the kind that you use in a closet to hang clothes from. I ramped them up a little with some gray paint. I think I have them cut at 24″. you have wonderful taste and a real flair for putting together a room. I’ve loved looking at some of your other posts too. I’m much more minimalistic but I can still appreciate a beautiful collection of items grouped tastefully! I found on Best of Blogosphere. Your mantle is beautiful! I love the grey and neutrals. Really pretty. I love the colors in this lovely space. I can totally relate to putting too much away, Wendy. After Christmas is over, I just want to get rid of it all! LOL I’m hoping to make the trek to the PB Outlet that closest to me in early March. Hope they have some treasures then! Very pretty Suzy! Love all the white and natural elements you used. Thank you, Brittany! Hope you and your family are doing well! Your mantel is great. I particularly like the galvanized steel container you are using for your greenery. I love vintage metals more than, well almost anything. Oh goodness – thank you, Lisa! What a comfortable and cozy area! I do love the wood and wire piece above the fireplace. I love putting the holiday decorations away and having a nice uncluttered space. Thanks so much for linking up with us at the Best of the Blogosphere. We would love to see you back to share another post tomorrow! I know just what you mean – I need a little breathing room after all the holiday decorating. Thanks for posting this gorgeous idea – it’s a breath of fresh air! Thanks for sharing this with us on Throwback Thursday! Hope to see you next week! I love your mantel- it looks absolutely gorgeous! Thank you so much for linking up to the Handmade Hangout! I’ll be featuring these on my blog (occasionallycrafty.com) when the new linky goes live at 6pm ET. I hope you will stop by and link up again! This is gorgeous! I can never figure out what to do with my mantle so I just put my nativity scene on it. Thanks for sharing with Saucy Saturdays! I am pinning for next year! Thank you Suzy for sharing your home and ideas with us. I came across your blog through Pinterest. I have to say of all the people I followed, you are the one that I consistently enjoy the most. Your decorating style touches me and inspires me. Everything looks so inviting and classy. Every day I look forward to what you are sharing with us. Keep up the good work. I hope others will eventually come to know you and appreciate you the way I do. I love your style! 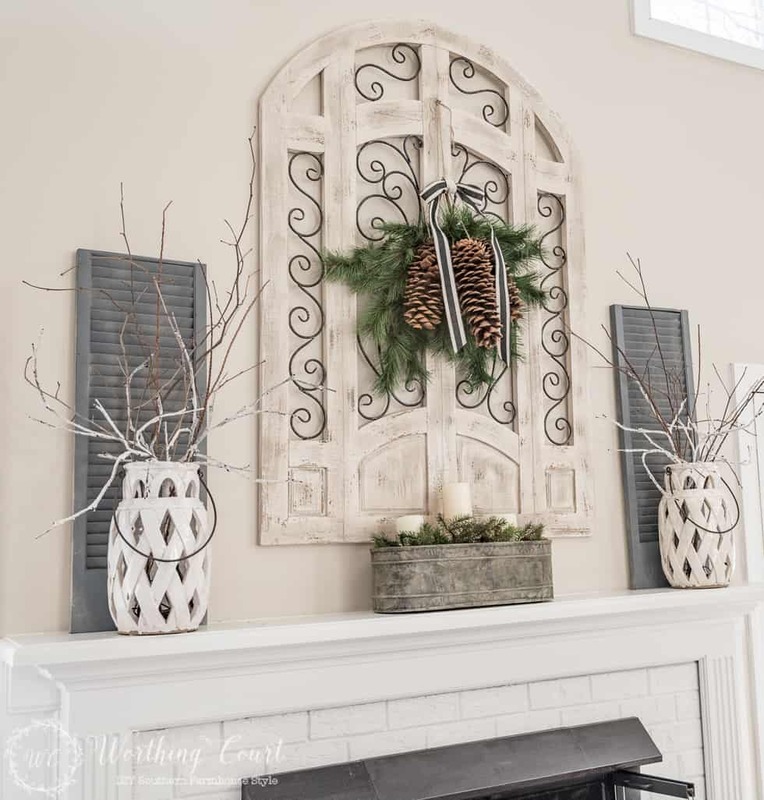 Where did you purchase the shutters above your fireplace? Hi Kandy. Those shutters are actually a pair of bifold doors that I cut in half and then painted. 😀 I used the other half of them in my dining room. I LOVE!!! 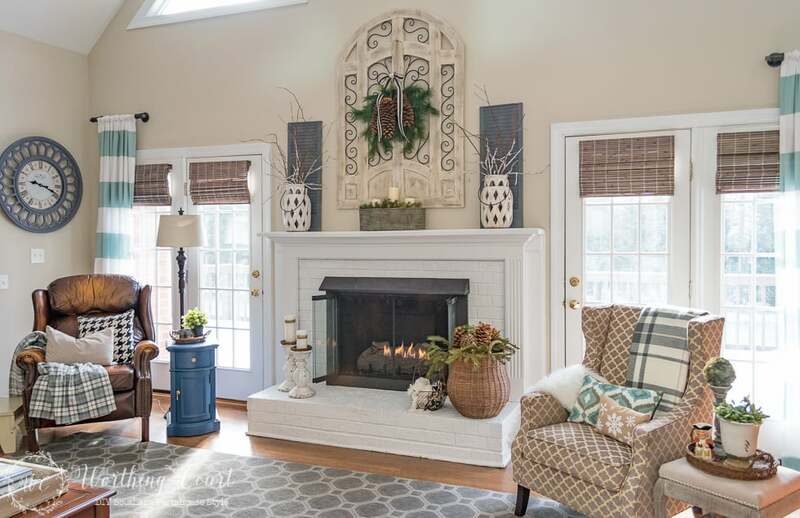 <3 THIS MANTLE FEATURING THE WALL HANGING FROM KIRKLAND!!! THIS IS MY FAVORITE, AND I WANT TO USE THE IDEA. THANK YOU!!! 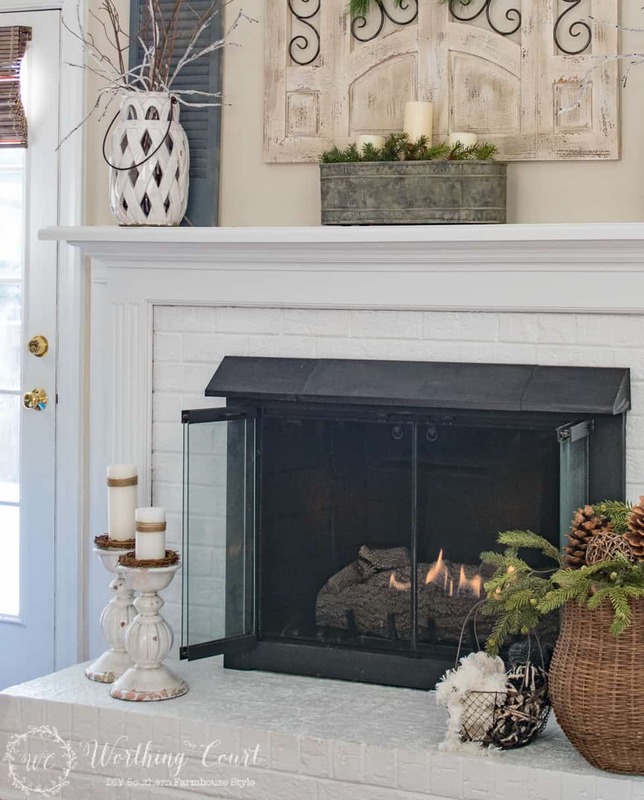 Thank you for these inspiring mantel ideas! 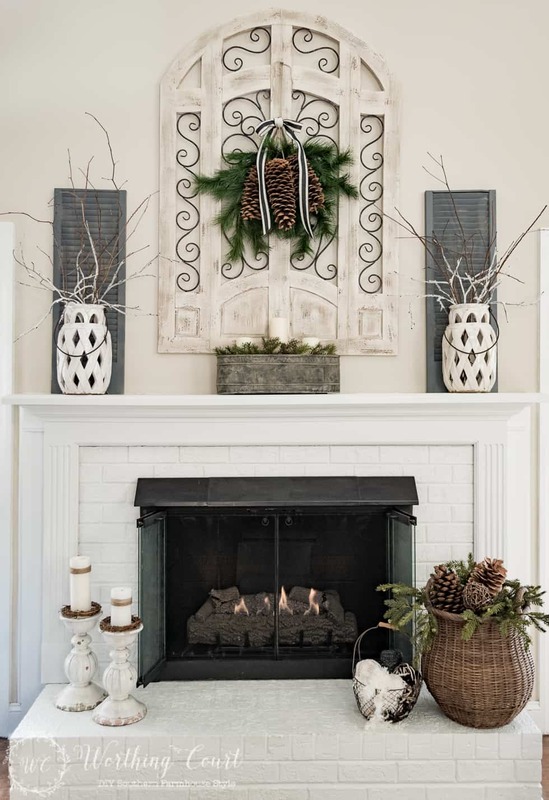 I am always looking for unique ways to dress up our mantel! Your mantle looks great. Holidays are here, fire in the fireplace, family arriving, decorating done, priceless. Happy holidays to you and your family. Very pretty! Wishing you a very Merry Christmas!! Your mantle is so pretty! I love the simplicity of it. Your family room is perfect. I love the way you decorated it. Merry Christmas to you and your family. I agree with you on the wood/metal piece above the fireplace. Seeing previous photos of it I think it is meant to be there. I recently discovered your blog and immediately subscribed. I love your fireplace decor. The Wooden Plaque is a very nice piece. I do not have a fire place but an item like that could create a nice focal point over a sofa table . Thanks for sharing the idea! I love your blog! I look forward to reading it every day and I save every thing to folders, so I can revisit anytime for all your great decorating tips. 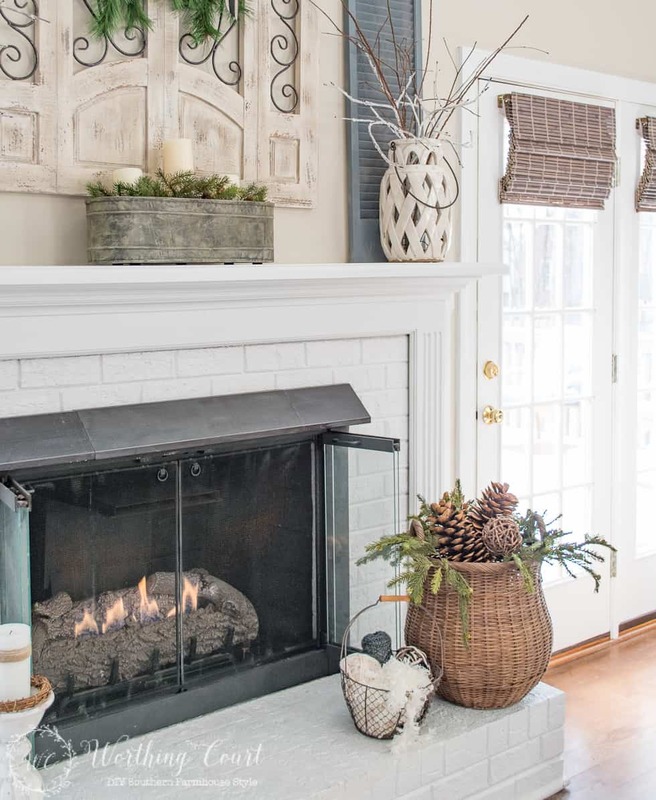 I am having knee replacement surgery on Jan. 2 and I will be quickly replacing Christmas decor with winter and your mantle is exactly what inspired me today! Thanks so much for all the great photos and advice. Such a beautiful mantel. Wishing you a very Merry Christmas!! Inspiring as usual. My mantle is usually always full, mainly because I have too many things I love to look at. Lol. Hi Rosie. Thank you so much for your sweet comment! Our floors are solid white oak flooring and are stained with Minwax stain in their Special Walnut color. As usual everything is perfect. A true gift you have putting your talents together to make such a warm inviting home. Thank you so much for sharing, and giving others your great ideas. Suzy, I love the winter fireplace! It’s warm and inviting without being overpowering. It fits perfectly in your beautiful home!! You asked us to describe the space in one word. I can’t decide between “homey” and “inviting.” In any event, it feels like a warm fuzzy hug! Can you please tell me where you purchased your basket vase? I love your decor!! Thank you.